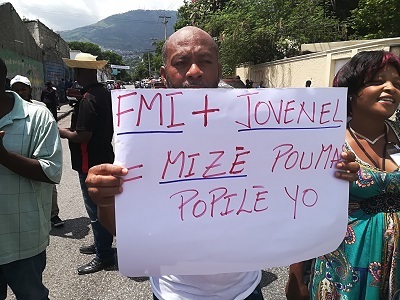 On the morning of May 25th, a large group of people’s organizations of Haiti mobilized in the capital, Puerto Principe, demanding the fulfillment of an extension agenda of demands from the State and the president Jovenel Moïse. The mobilization was called by an platform known as “January 22nd Movement”, that unites various sectors such as unions, peasants, students and urban fringes. The organizations also participate in the continental and global platforms: ALBA Movimientos and Vía Campesina. The gathering took place in Chal Sounè, the central point of the city, where the ministries of Finance, Justice and Social Issues, and the Car Insurance Office against Third Parties (OAVCT) are situated. The protesters exhibited posters of rejection to International Monetary Fund (IMF) and protested against the government’s attempt to increase fuel prices. An explicit order from government’s financial entity is there behind these policies, which for years has been practicing a guardian role in the economy of this small island nation. During the protest, Rosnel Jean-Baptiste, the chief leader of peasant’s movement Tèt Kole, denounced the intent of IMF and the World Bank to liquidate country’s economy. Jean-Baptiste also pronounced against the continuity of the neoliberal policies, -re-implanted after the coup d’etat of 2004, that overthrew the democratic government of Jean-Bertrand Aristide-, and against the attempt to privatize public entities such as Haiti Electricity Company (EDH) and National Office of Old-age Insurance (ONA). The peasant leader also demanded higher investments in the agriculture sector and an integral agricultural reform plan to decentralize and provide the limited fertile land of the country to small peasants. In the same way, he pointed out the foreign intervention through the United Nations Mission for Justice Support in Haiti (MINUJUSTH). Lastly, he called for the active solidarity of all the people to put an end to the violation of Haitian national sovereignty and celebrated and supported the victory of the Chavista candidate Nicolás Maduro in the recent Venezuelan elections. Oxygene David, general secretary of the MOLEGHAF organization, pointed towards the uncertain situation of Haitian economy, with the resulting expansion of misery, hunger and housing shortage. The head also talked about the call for justice for John Rock Gourgieder, university student run over and disabled by the car of Jean Yves Blot, the Dean of the Faculty of Ethnology, in the Haiti State University. This assault happened in the context of students protesting for a university reform and against the infrastructural insecurity of higher education, due to the damage that happened after the earthquake on January 12, 2010. The protesters also mobilized to demand an increase in minimum salary from current 335 gourds a day (equal to $5.17, one of the lowest salaries in the continent) to 1000 ($15.50). Within the agenda of demands of the movements, the demand for reincorporation of dismissed workers from OAVCT and from National Centre of Haitian Workers (CNOHA) was prominent. Similarly, the demand for justice against corruption cases regarding Petrocaribe funds squandered by Haitian State also appeared.